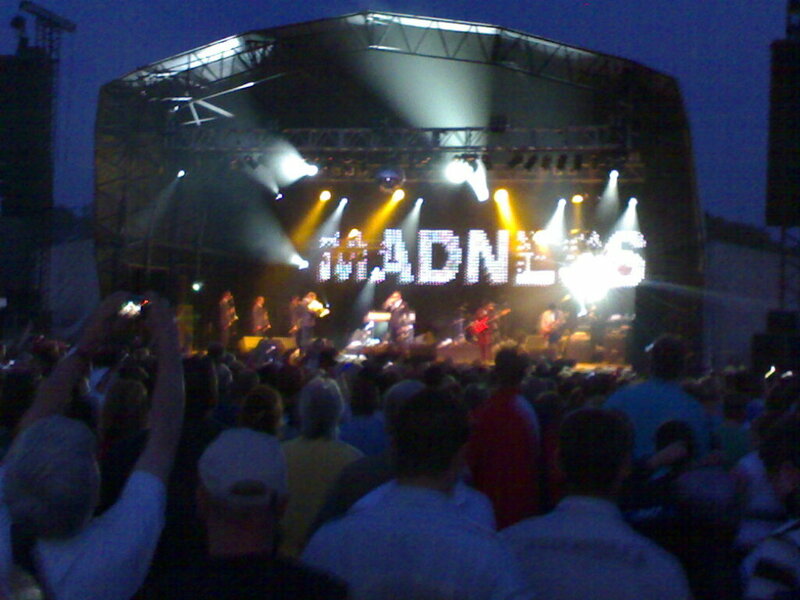 The last (and only other) time I saw Madness was at college in France in ooh err… about 1980 or something. Needless to say the French didn’t get them at al so it was like a show to the gaggle of Brits down the front. Now almost thirty years later here they are, the first band to play Princess Anne’s gaff, Gatcombe Park just up the road for home. Well off we went Mr and Mrs Me and Mr and Mrs International Decorator Supremo, armed with our picnic and comfy(ish) chairs. The picnic had to be consumed before entering the ‘arena’ as of course they wanted to rip everyone off for as much cash as possible from the yeuky drink and ghastly food stalls – should have known. But never mind, it was a splendid sunny evening after a torrentially wet morning and the lad texted in to say all was dry and funky down at Glasto. The crowd was that odd mix of Range Rover Sport crowd and others who, perhaps thirty years ago, were probably more of the skinhead persuasion, but everyone was in good humour and there was much jiggling of tattoo covered flesh alongside the Boden types more sedate wiggles. Not to be robbed of any of the atmosphere we moved into the throng for the main talent portion and waited the arrival of the Lads. Despite clearly being a bit older than they were they still looked the part in dark suits and shades. The sound was blasting for an open air gig and was mercifully pretty spot on, OK the obligatory bass heavy but with enough ‘top’ to make it all a pretty fair sounding show. Of course there was more than a smattering of the oldies which they blasted out with gusto and aplomb – truth be told they sounded pretty tight and together. There were a few songs from their recent CD which sounded fair enough, the only duff song of the evening being the title track to their new CD, the Liberty of Norton Folgate. Now this might sound just fine on the CD but was an unwise choice last night – too long, a little complex and not anywhere near enough bouncy enough for the occasion. The end of the show wound up with all the good expected items, Our House, Baggy Trousers, Night Boat to Cairo – fair took me back it did! All in all though a great fun time, 5000 bods a-dancing and a-jiggling, some rollicking good tunes and a fine way to spend a summers evening – I wonder of Princess Anne was shaking her booty? No, I guess not, just counting I the ackers. This entry was posted in Uncategorized and tagged Aswad, Gig, Madness. Bookmark the permalink.